NEW! Self-Paced Workshops from OLC. 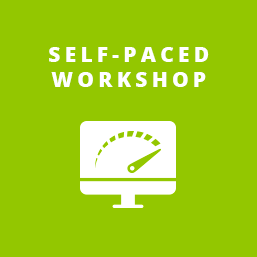 Now you can complete a workshop at a time and pace that is convenient for you. The OLC Institute for Professional Development now offers self-paced workshops. These on-demand learning opportunities allow you to complete a workshop at a time and pace that is convenient for you. Similar to our instructor-led offerings, you have access to the workshop for 365 days starting from the day you enroll, and our self-paced workshops also count towards fulfilling electives in the Online Teaching Certificate Program. These workshops are entirely self-paced and are not instructor facilitated. The estimated time for completion is 6-8 hours, but you will likely find yourself spending more time as you investigate some of the additional resources that are provided. An Award of Completion is available for those who complete all required activities within 365 days of their enrollment. Similar to our instructor-led offerings, you have access to the workshop for 365 days starting from the day you enroll. Our self-paced workshops also count towards fulfilling electives in the Online Teaching Certificate Program. Stay tuned for more self-paced offerings as they become available! Complete the Sign Up For Updates form on the right to be notified by email.